Pay Per Click marketing (PPC) is a broad term used in digital marketing that covers anything your law firm can do to boost your online presence by purchasing ads online. If your law firm wants to grow and acquire new leads, then you will need to focus your efforts on using SEO and PPC. 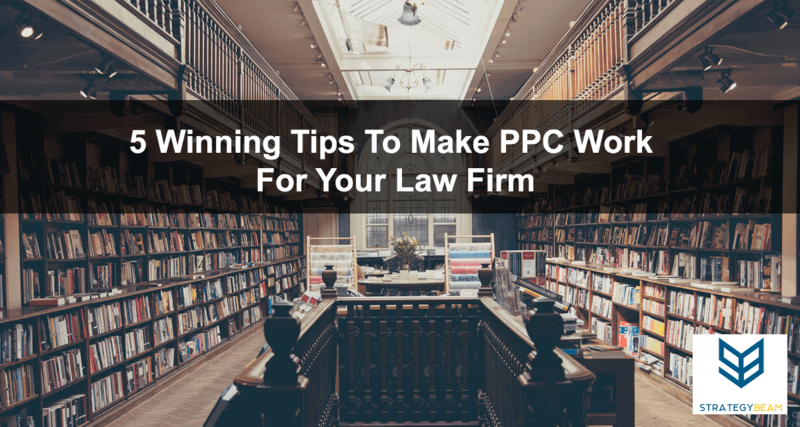 We already looked at some ways your law firm can use content marketing and how to write great attorney website content, but today I want to talk about how your law firm can integrate PPC into your firm’s digital marketing mix. I have found that attorneys are finding it harder than ever to keep their margins high while attracting new clients and retaining large corporate accounts. PPC provides the most control for your law firm to control your messaging and define your audience. This means that you have the ability to present targeted messaging and highlight what makes your law firm unique and the best choice compared to your competition. While your firm will enjoy additional control with PPC, you will also need to pay for each click. So, while PPC is a powerful tool and can give you an advantage over your competition, your firm will also need to consider whether PPC marketing is a good fit for your law firm based on your goals and available resources. 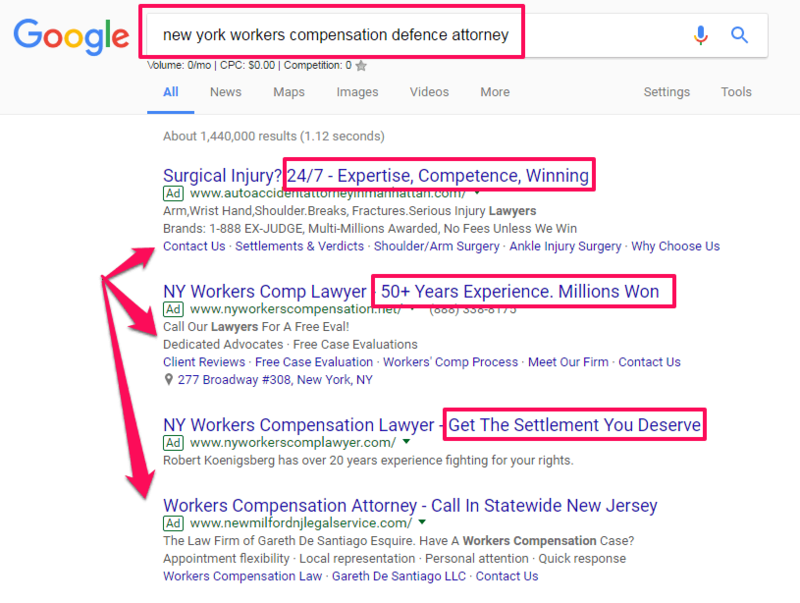 Can My Law Firm Afford PPC Marketing? Your law firm’s PPC campaign can get pretty expensive depending on your location, area of practice, and some other aspects. Whenever I speak with an Orlando law firm looking for PPC marketing advice, I start out by telling them the costs and benefits of running PPC for lawyers. 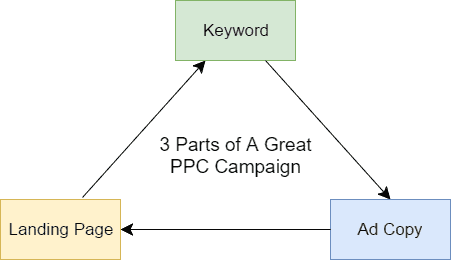 Legal marketing PPC strategies are often the most expensive type of campaign you can run. For example, if you are a workers’ compensation defense firm, you can expect to pay about $24 to $36 per click. That means that anytime someone searches for your products and services that you are promoting you will pay that amount of money each time someone clicks on your ad. While each click can cost your firm $24 or more, the thing you should focus on is ROI. That means that you should look at PPC as an investment for your firm. The legal industry requires that your PPC manager has a strong background in campaign management and should know how to optimize landing pages and other elements of your marketing plan. If you are concerned about the budget, but you want to see how impactful PPC can have for your law firm, then you should consider limiting the time and budget to test a campaign. For example, you can give yourself 30 days and a budget of $5,000. This will give your firm a timeframe to at least test this marketing platform and see what impact it has on your bottom line. The legal industry is incredibly competitive in search engines, so you need to make sure that your law firm stands out. The first thing you should do is to perform competitive research so you can have a better idea of what your competition is offering so you can find areas to stand out. Craft a relevant and actionable call-to-action that will get your audience to act. This CTA should be based on the needs of your customers and align with your business goals. Highlight ways to establish your firm’s authority and build trust with your audience. Since your customers are looking for a lawyer, they are probably in a sticky situation so you should optimize your website and PPC messaging to help calm their nerves. Clearly, state features that your law firm offers because they will increase your value and get you more qualified engagement. Do you offer 24/7 customer service? Do you offer a free consultation? While competitive research is necessary, you want to avoid going overboard. I have seen law firms spend hours researching their competition. This time could have been better spent focusing on your customers, improving your services, or running your firm. Just check out the PPC ads of your competition, their websites, and overall messaging to find ways to get your firm to stand out. An experienced PPC manager will be able to work with you and help you prioritize your efforts to ensure you are reaching your customers. Since PPC for your law firm can be somewhat expensive, it is a good idea to limit the reach of your ads. Instead of showing your ads to everyone in the world, you can define the geographic area that your message will show. Restricting the reach of your ads is a great way to gain more control over the spend of your PPC campaigns. Doing this also makes sense for the legal industry because depending on what area of law you practice, your customer base will likely be close to your offices. 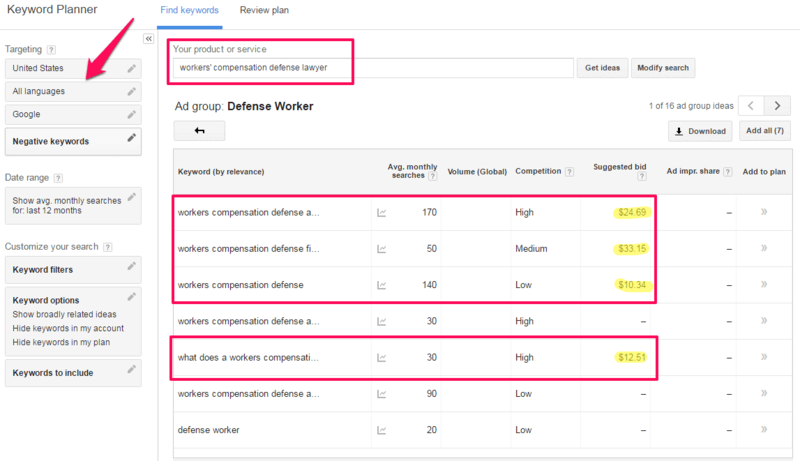 As a result, you can set your ads to only show to an audience within a particular area. The average client is not going to travel very far for legal services, and many of your customers will likely want to have someone close to them. Focusing your PPC efforts in a limited geographic area also means that you can focus your budget on a small area that can lead to increased results for each dollar spent. PPC is a user intent based marketing channel because your ad will only show when specific keywords are entered into a search engine. This means that your law firm PPC campaign hinges on the fact that you base your advertising around relevant terms that your target audience is searching for. If you do not have the time or desire to write your own PPC ads or other content then you should consider hiring a freelance copywriter for your law firm marketing needs. If your ad shows up for irrelevant search terms, then you will be spending a lot of money and have a low ROI. This means that you need to align your ad copy and keywords with the stage that your customer journey. Your law firm needs to create relevant ads that are triggered when valuable keywords are used in search engines. The ad copy should reflect the questions, needs, and emotional state that your readers are in at that moment. Your landing page is the third part of a successful attorney PPC campaign. The landing page plays an important role because this page will have the CTA that will convert your reader. Lower PPC costs: Google and other search engines use an algorithm to calculate how much you have to pay each time someone clicks on your ad. This is called the Quality Score, and this is one factor that influences the effectiveness and efficiency of the PPC campaign for your law firm. Improve PCP placement on search engines: Search engines will consider the quality of content and relevancy of your landing page with your PPC ads. If your landing page is optimized then search engines will show your PPC ads more often than if your landing page was not optimized. This means you can increase performance by just improving your landing page! More PPC leads: When your landing page follows best practices, you will be able to convert more leads into paying customers. PPC is all about conversions, and once someone clicks on your ad, you pay for that click. Now is the time to convert that reader! Since your reader saw the PPC ad and was interested enough to click on the ad. At this point your audience has shown a high level of intent and interest, so your landing page needs to close the deal and convert your customers. An experienced PPC campaign manager will help you optimize your PPC ads based on the needs and intent of your target audience. While an optimized landing page is great, the best way for your firm to close leads is to take phone calls. This is because your law firm can leverage the direct interaction with your clients. In general, a call is worth much more than a click on a website because you can have greater control over the user experience and increase conversions. Since most of your customers are likely searching for your services on a mobile device, your law firm will need to optimize your PPC campaigns for mobile views. Along with optimizing messaging and other aspects, you should also include Call Extensions on all of your mobile ads. Here are some tips your firm can use to improve ROI for PPC campaigns. These ideas will help you focus your budget while also capturing the highest quality leads for your law firm. You can tell Google and other search engines only to show your ads on mobile devices. This is an excellent approach to attorney PPC because you can customize the ad, ad extensions, and bidding strategy since mobile views are different than desktop views. Use call extensions: You can include a click to call button on your mobile ads so your audience can quickly call your office. This call extension is a great way to increase phone calls by including the number of ads. Track every phone call: The only way to show the value of your PPC for your law firm is to track conversions, including phone calls that come from your PPC ads. Whether you are following calls from a landing page or directly from mobile SERPs, your firm should have a way to track the calls. This will help you attribute success and revenue so you can tweak your strategy in a data-driven manner. Ensure you have a professional answering service available 24/7: Since you want to drive your audience to call your law firm, you should have an answering service that will take their calls no matter the time of day. It would be bad to have someone call your office but lose a client because they were not able to talk with someone at that moment. Even if your law firm is on the fence about running a PPC campaign as part of your law firm marketing strategy, you should start out with mobile-only ads. 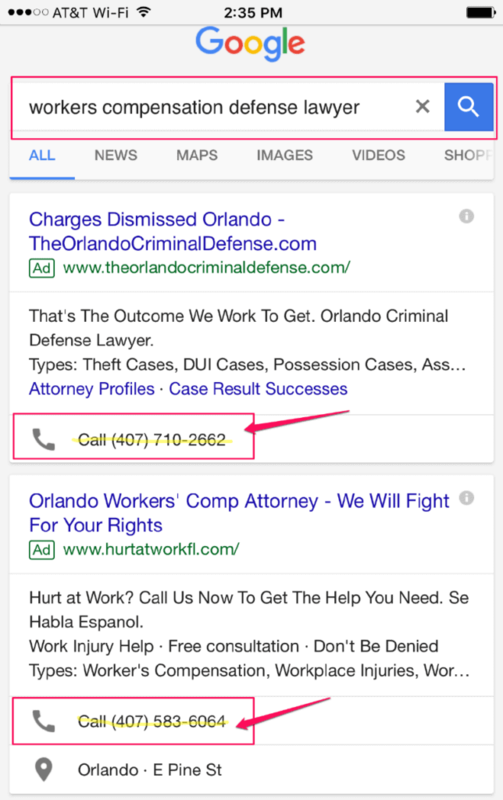 Utilizing the call extension on your ads will have the largest impact and could be a good way to feel out PPC as a marketing channel for your law firm. If your law firm is looking to attract qualified leads to help you reach your business goals then PPC might be the answer you are searching for. While there is an upfront investment to set up a PPC campaign, your law firm will see financial benefits from your efforts. Don’t risk missing the opportunity to reach your audience and expand your market. Hire a professional PPC campaign manager who knows how to build a strategy, set up your campaign, and then optimize so your firm achieves the goals you are after. Contact me today if you are serious about reaching your business goals this year and I will work with you to develop a winning strategy!